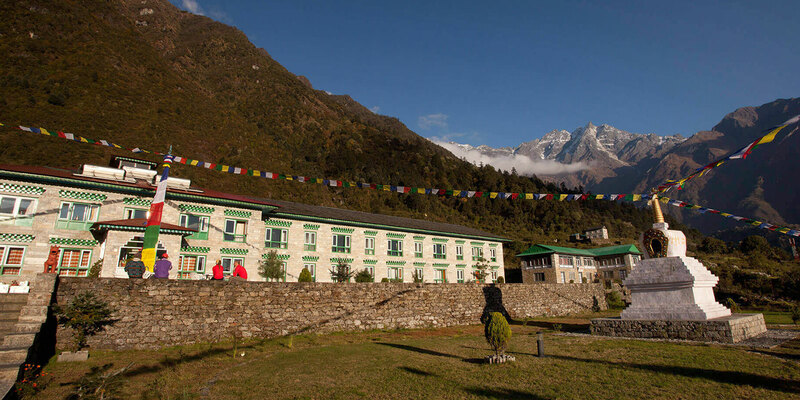 Conveniently situated at the gateway to the Khumbu, YMH Lukla provides the perfect beginning and end to your trekking holiday. Now with Himalayan Healers spa. Get to: 15 minutes from the airstrip. Lukla lodge offers the perfect opportunity to reflect on your travels. Whether you have come from Namche, Kongde or Phakding you will find here the perfect place to wind down. The lodge has the most beautiful decoration of all with the wonderful paintings of a Buddhist monastery providing a lovely tranquil environment. All this and you are only one step away from your short flight back to civilisation. If you have time you must visit the near by gompa founded by Kyamgo-Deltsen-Donden born in 1777 AD originally from Sikkim. Our bedrooms are finished in a traditional Khumbu Style with natural wood featuring extensively, for a warm cozy and relaxing feel. Each room has been designed with your total comfort in mind. All bedrooms offer either king-size bed or twin-bedded accommodation. To ensure your complete comfort, we operate a no smoking policy throughout the hotel and also do not allow any pets. We have an electric mat in each bed and clean blanket to keep you warm. A thermos of hot boiled water is served in each room. You can read your books lying on your bed with the clay electric lamp by your table side. Our dining hall is designed in traditional Khumbu style, decorated with copper pots and fine traditional paintings on the wall and ceiling. We can arrange setting for 40 people. We have sealed chimney in our dining room for our guest who can enjoy their mouth watering meal with the warmth of the fire. We serve organic vegetables which are grown in our own green house. Lukla is a town in the Solukhumbu District of Sagarmatha Zone north-eastern Nepal. It is located within the Khumbu area where most people visiting the Himalayas near Mount Everest start their journey. Lukla means place with many goats and sheep, one is not likely to see many roaming around these days. It is mainly inhabited by the Sherpas and has a population of around 1200. It houses the oldest Sherpa monastery built around the start of 19th century by Lama Kyamgon-Deltsen-Donden. Born in 1777 AD, his ancestral home was in Lathetar in West Sikkim. By our initiative this historical Gompa is now being renovated to its former glory. Tenzing-Hillary Airport, also known as Lukla Airport, is a small airport, In January 2008, the airport was renamed in honor of Sir Edmund Hillary and Sherpa Tenzing Norgay, the first persons to reach the summit of Mount Everest. There are daily flights between Lukla and Kathmandu during daylight hours and in good weather. Although the flying distance is short (30 to 40 Minutes), weather differs raining in Lukla while the sun is shining in Kathmandu. The paved tarmac is only accessible to helicopters and small fixed wing short takeoff and landing (STOL) aircraft such as Twin Otters or Dornier Do 228. There is about a 700-metre (2,000 ft) angled drop at the end of the runway to the valley below. The airport is contained within a chain link fence and patrolled by the Nepal armed police or civil police around the clock. Pasang Lhamu Nicole-Nicky Hospital in Lukla is established in honor of first Nepalese women Pasang Lhamu Sherpa to scale the Mount Everest and first Swiss mountain guide Nichole Nicky. Pasang Lhamu Sherpa, first Nepalese women to reach the top of the mountain on April 22nd, 1993 via South ridge was killed while ascending from the peak. The hospital is providing service to mountaineers along with 17 thousand locals of Chaurikharka, Juving and Walk village development committees. The Lukla Dumche which was started in 1995, takes place from the seventh to the fourth month. During the Dumche, Ralpa Dorje's twisted iron rod is displayed at Thangme and the image of Shakyamuni Buddha and the seven grains at rimejung.